It's fresh hop season, part of the beer cycle we've somehow managed to construct in recent years. These beers aren't my favorite, though I seem to like them better now than I did a few years ago. Anyway, I'm not here to talk about fresh hop beers. Because it's also football season. Sooner or later I had to get around to talking about football. Not the modern game, with its multiple game costumes and giant disparity at the college level. Or the NFL's problems managing the behavior of its players (no, I'm not referring to the national anthem protests). 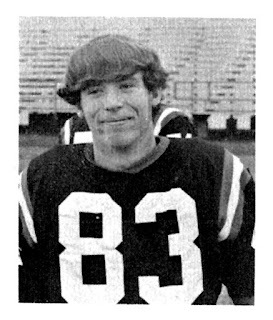 Some 44 years ago this fall, I was closing out my high school football career. You might say football was in my DNA. My dad was a dedicated fan until the day he died. The first TV we had in my family when I was a small child was purchased so my dad could watch football games. Later on, my dad took me to football games at Kezar Stadium in San Francisco. Maybe you remember that place, now gone, from the first Dirty Harry movie. When we moved to the Inland Northwest, I became a fan of nearby Washington State, where I eventually attended college. Later, we got the Seahawks. Growing up in smalltown Clarkston, Washington, I fully expected to play high school football when it was my turn. Somehow I never played Pee Wee football. That was an inexcusable oversight because a lot of my friends played. I mingled in non-organized games. My freshmen year of high school was an awkward time for sports in my school. I don't recall the details, but the school district was short on funds. As a result, there was no freshmen football. If you were a freshmen and you wanted to play football, you had to make the junior varsity. Coming into three-a-day practices without any formal football experience was a shock. The running, the calisthenics, the weight of the equipment and the August heat combined for not a lot of fun. But I wanted to play and I stuck with it, somehow making the team. I don't remember playing much that first year. There were freshmen who did play, mostly guys who had played Pee Wee and had experience and talent. 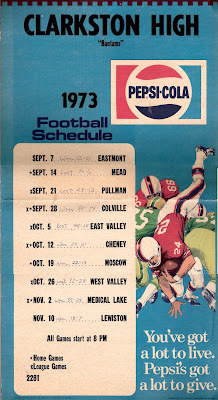 I was probably fast enough and agile enough, but I was behind the development curve of organized football. By the time I was a junior, I had caught up a bit. Off-season practice, weights and beer helped. You laugh, but you knew beer would be mentioned. One of our coaches quietly advised some of us to drink beer and work out in the off-season. He said we'd gain strength and stay quick and agile. Some of us did our best to accommodate his suggestion and, honestly, it was good advice. I started out my junior year playing quarterback. During the season, I eventually played wide receiver, running back, safety and a few other positions. It was defense where I probably played the best football of my life. I was on the field a lot, playing both ways and getting exhausted. There were certainly a few concussions. But I'm fine now. Trust me. Preparing for my senior season, I lifted a lot of weights and drank a lot of beer...Lucky Lager, Hamm's, Schlitz, Coors. Only the best. I figured to play defense, but worked on improving my throwing accuracy in case I got the opportunity to play quarterback. We had a new coach coming in and expectations were high. One reason we had a new coach is that Clarkston had failed to beat cross-river rival Lewiston for more than a decade. Lewiston was then and still is considerably larger than Clarkston. But Clarkston had quite a few good teams that couldn't find a way to beat Lewiston. So our veteran coach resigned or was forced out. Sometimes, you just gotta go. Of course, beating Lewiston had been a goal of my class since grade school. We had watched a string of really good Clarkston teams lose to Lewiston for years. It seemed like there was some kind of jinx at work. We figured we would somehow beat the odds and the jinx. I'm sure we weren't the only bunch of kids packing around that idea in Clarkston schools. 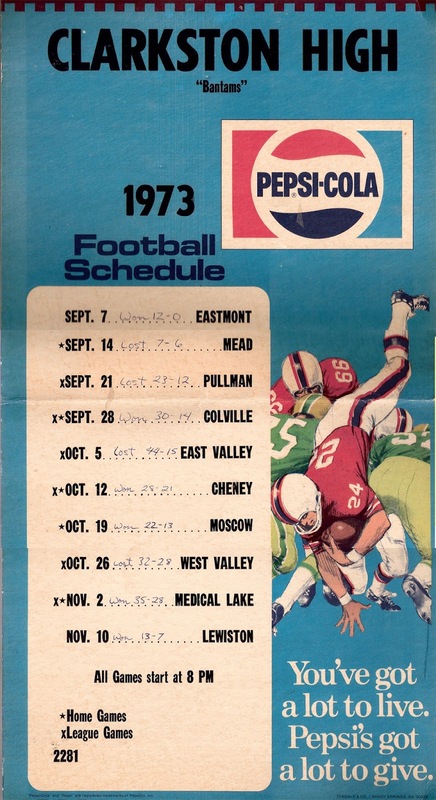 The 1973 season was an up and down affair. We won a game, lost two, won one, lost one, won two. Facing Lewiston in our last game, we were sitting on a 5-4 record. Our rookie coach didn't hesitate to remind us on several occasions before the game that 6-4 was going to sound a lot better than 5-5 when we recounted the season in future years. Sure enough. For its part, Lewiston had suffered through a bad year under a flashy new coach. As always, they had a ton of talent. But the guy hadn't figured out how to use it. That led to dissention in the ranks and some good players had quit the team. It looked like they might be an easy mark. We knew better, though. We'd seen too many sketchy Lewiston teams beat good Clarkston teams. To make a long story short, we wound up winning the game 13-7. The margin of victory would have been greater, but one of our wacky star players tossed the ball in the air short of the goal line on what would have been a touchdown. Dumb. Anyway, the long Lewiston drought was over and Clarkston finally had bragging rights for a year. There was celebration. And beer. As luck would have it, my own senior season was TKO'd before it started. Working on a piece of farm machinery over the summer, I suffered a hand injury that required surgery. It was my right hand, my throwing hand. The caste came off just before fall practice began. I would not be playing quarterback. Indeed, it was a stretch to think I could play defense with that hand. But I tried.